Is MPS facing an identity crisis? According to Quocirca’s research, almost 30% of enterprises indicate that printing is critical to their business with a further 45% indicating it to be very important for the majority of business activities. A dependence on print is particularly high in the highly regulated financial and professional services industries. These industries are also amongst those most likely to report that expenditure in MPS will rise over the next year – 50% of professional services and 60% indicated MPS spending will rise. The growth in MPS is fuelled by the need to control costs – both financial and environmental – through lowering consumable and paper usage as well as getting more control on document security. The first step to address these challenges and optimise the print infrastructure is to leverage the multifunction printer (MFP). Clearly, reducing a sprawling printer fleet with fewer, energy-efficient MFPs is cost efficient – but they also set the stage for broader workflow automation as the MPS engagement develops. Modern MFPs are increasingly sophisticated, enabling document capture and routing to enterprise applications, together with advanced security features to minimise document security risks. Overall, 37% of all enterprises reported that they have a well-defined MFP strategy that maximises the benefits of smart MFPs, with a further 50% starting to better utilise these devices. MPS users are far more likely to have made the investment in smart MFPs and to be utilising them to a broader extent than their non-MPS counterparts. 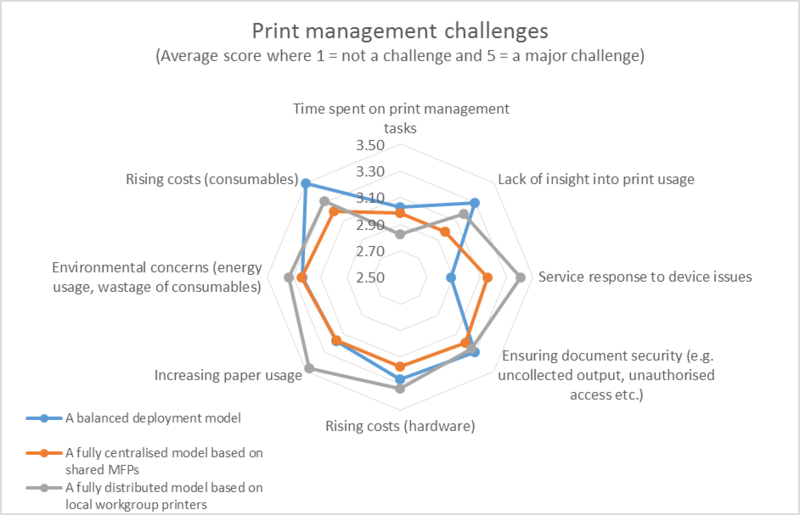 Overall, a centralised MFP model is certainly helping enterprises minimise their challenges around printing. Those not using MPS are clearly struggling across all areas, compared to those using MPS. Quocirca’s research reveals that almost half of respondents have been using MPS for over 3 years. 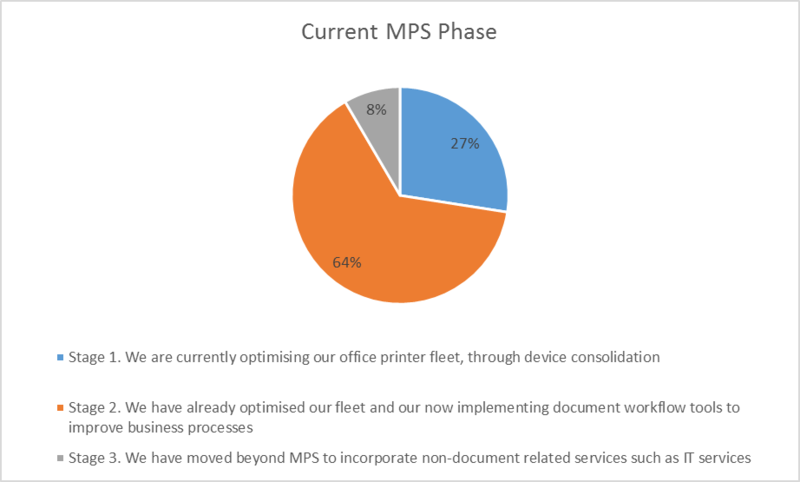 Consequently, the majority of enterprise customers will have moved beyond the initial stages of MPS engagements, with almost two thirds having optimised their fleet and implemented document workflow solutions to improve business processes. MPS providers have a huge opportunity to capitalise on the interest in document workflow automation. They are best positioned to understand the printing ecosystem, analyse document-related processes and implement effective hardware and software solutions to support better business process automation. This can range from capture and digitisation of paper documents at the MFP and routing to enterprise applications such as HR, Finance and Accounting. Certainly those organisations that are leveraging the value of MFP technology are reaping the benefits with better paper and digital workflow integration. 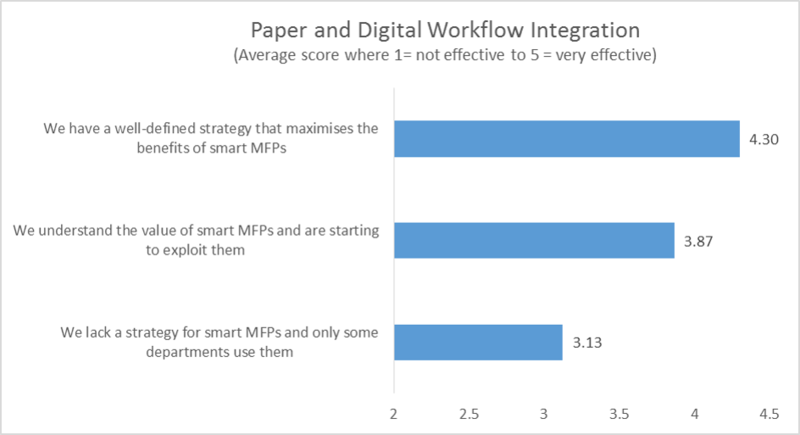 Those using MFPs are most likely to be confident on the integration of their paper and digital workflows. Overall, 85% of organisations (average score 4.3) with a well-defined MFP strategy believed their workflow integration to be effective or very effective, compared to approximately 40% of those without a clear MFP strategy. Certainly, MPS is moving beyond its roots as a hardware-centric offering, with workflow solutions providing distinct additional value to longer term engagements. 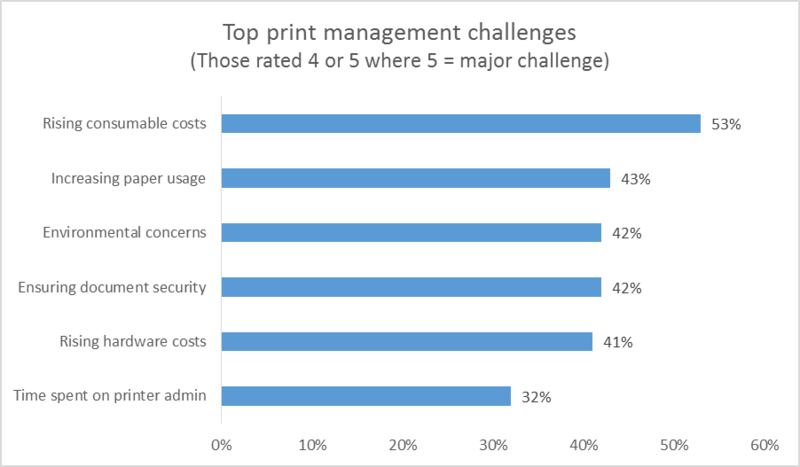 Those using MPS are far more satisfied with the management, control and performance of their print environment. Overall, 78% of those using MPS were satisfied or very satisfied compared to 50% of those not using MPS. Satisfaction levels were higher for those that had moved beyond basic MPS to incorporate broader workflow automation. Notably, those using a fully outsourced MPS provider rather than a hybrid approach to MPS reported higher satisfaction levels. The benefits of MPS are proven – organisations are reducing cost, lower environmental impact and reducing the risk associated with an unmanaged print infrastructure. 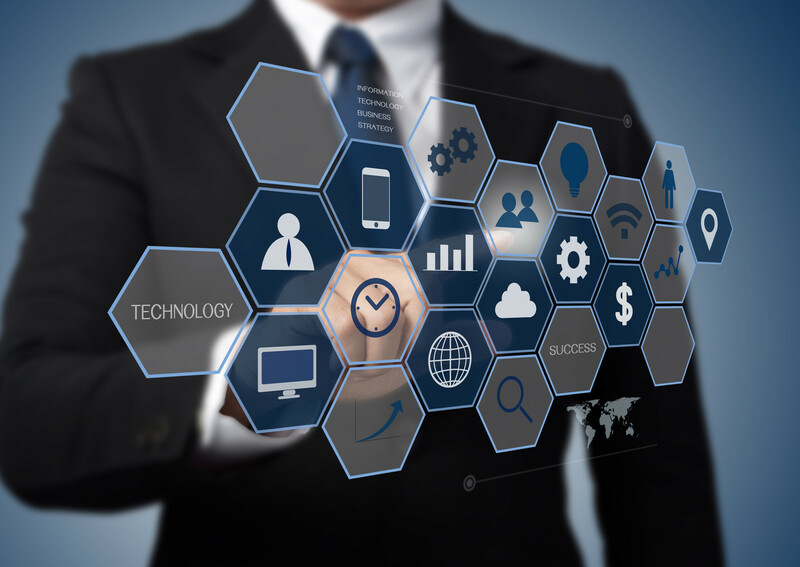 While business process automation is an excellent longer-term goal for MPS providers as they seek to broaden their service and solutions offerings, we cannot ignore the printing heritage of MPS. Certainly, MPS providers can help with managing information, content and workflow through a diverse range of solutions. However this should not be at the expense of focusing on core, established MPS competencies which will ultimately support any long-term vision for business transformation.